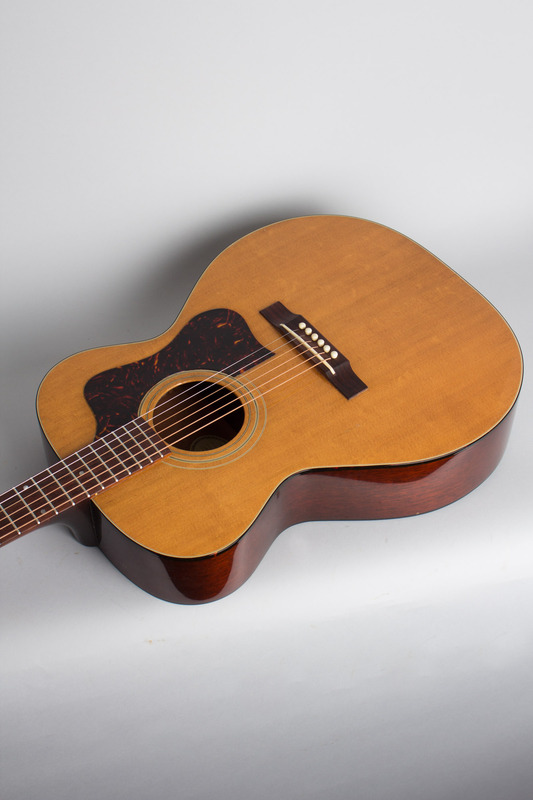 Guild F-30-NT Model Flat Top Acoustic Guitar (1961), made in Hoboken, NJ, serial # 16453, natural lacquer finish, mahogany back, sides and neck; spruce top, rosewood fingerboard, original brown alligator grain chipboard case. The often very fine sounding Guild flattops of the 1960's can be surprisingly hard to find these days, despite being a fairly popular choice when new. 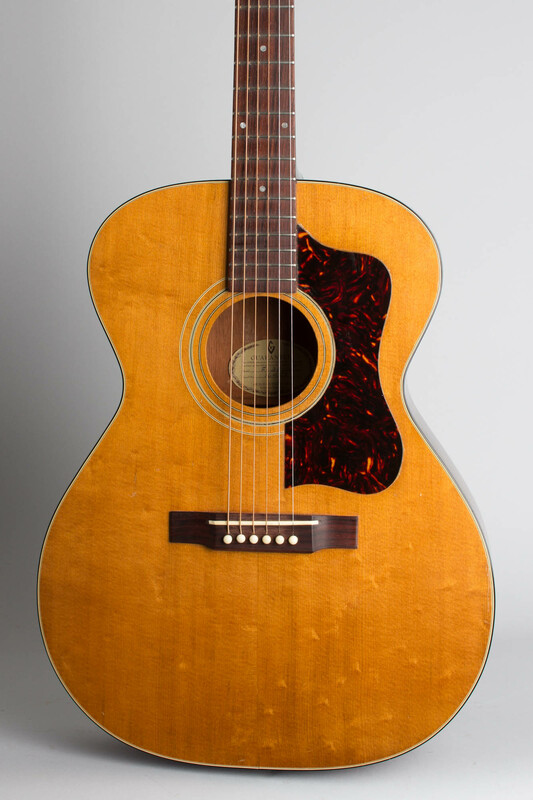 This guitar is a 1961 natural-top F-30 "Aragon", the midline, mid-size model in Guild's flat top line. 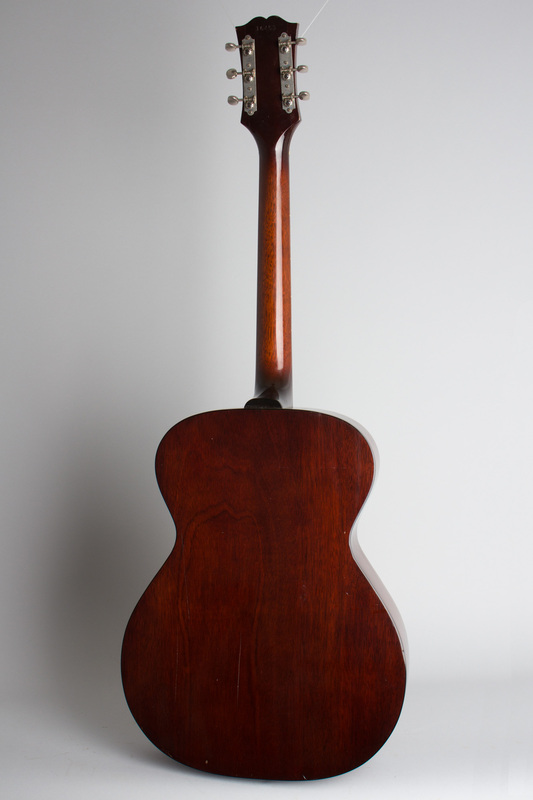 The F-30 stood in the company's line above the all mahogany M-20 (famously regarded as the "Nick Drake" guitar) and the F-20, which was the same size and shape with a spruce top. 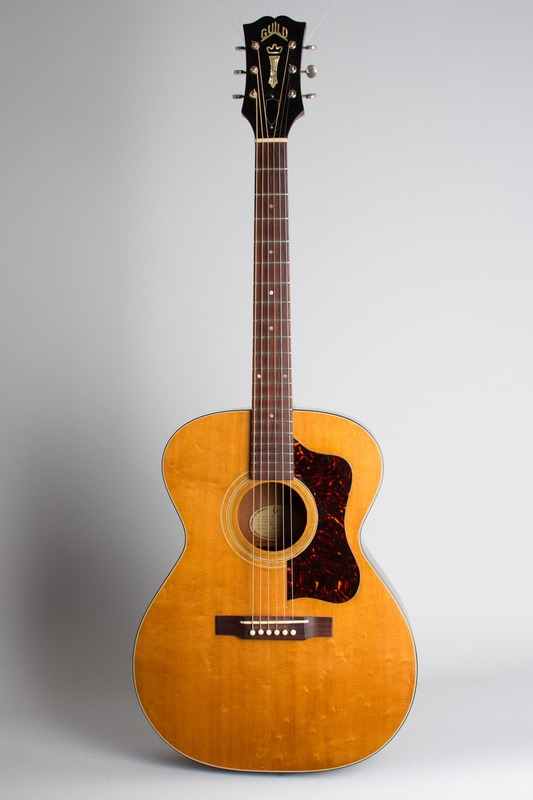 The somewhat larger F-30 is generally similar in layout to a Martin 000-18, but with a somewhat different body shape owing something to Gibson's narrow-waisted jumbo guitars. This is an extremely well-built and superbly responsive guitar, much lighter than Rhode-Island made 1970's Guilds and easily on par with similar size Martin or Gibson offerings from its era. 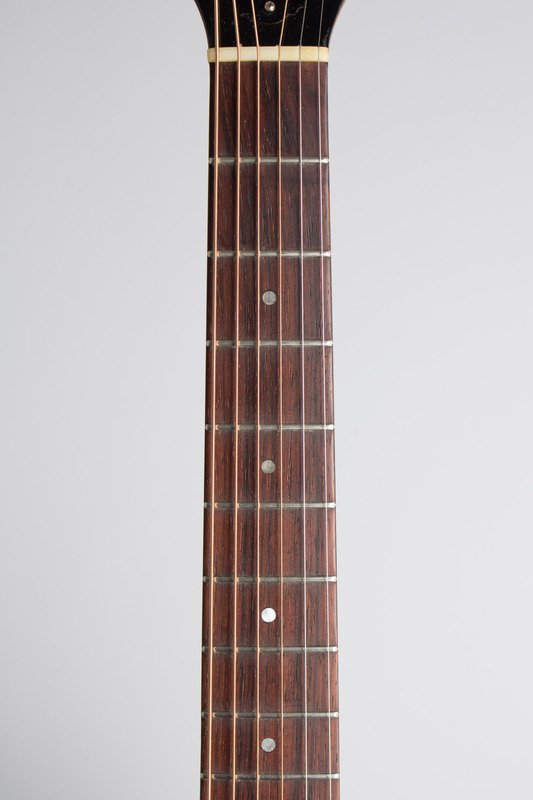 This early '60's model has some variant features from the more common mid 1960's examples including the older "open book" headstock shape, Waverly openback strip tuners and a slightly different pickguard shape. This one has a thin laminate mahogany back, an unusual feature for the model and one we have only seen occasionally in this 1960's period. 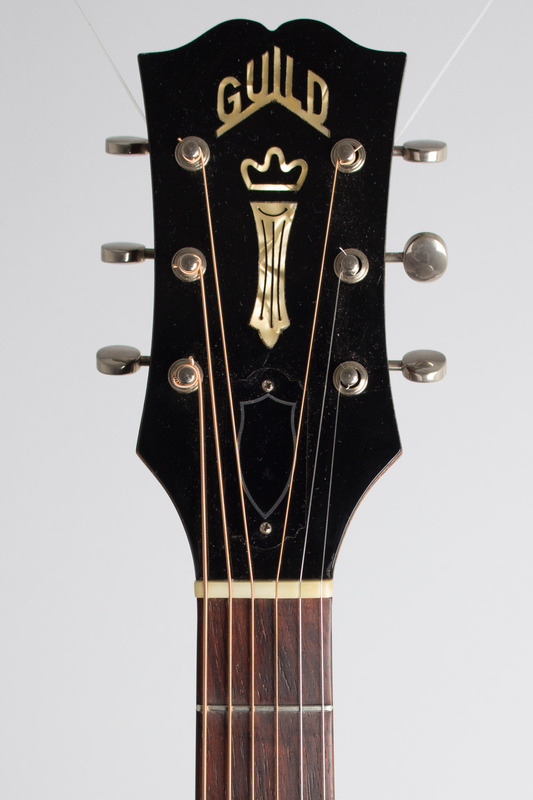 In the 1970's Guild used this construction on most flat tops, but in the early '60's it is not universal. Notwithstanding this construction quirk this particular F-30 is a wonderful guitar offering a much bigger sound than some. The tone has plenty of depth but a crisp ring on top as well. It makes a smooth finger-or-flatpicking guitar, works equally well as a strummed chord machine and would make an excellent recording instrument. Overall length is 40 in. (101.6 cm. ), 15 1/4 in. (38.7 cm.) wide at lower bout, and 4 in. (10.2 cm.) in depth at side. Scale length is 24 3/4 in. (629 mm.). Width of nut is 1 11/16 in. (43 mm.). This is a very nice and all original example overall, the cleanest of this model we have had in a long time with only some very light play wear and minor repair. There are some small dings and scrapes to the finish but no heavy wear. This guitar has had a very cleanly done neck set with some light fretwork and plays perfectly. The original rosewood bridge has never been cut down. 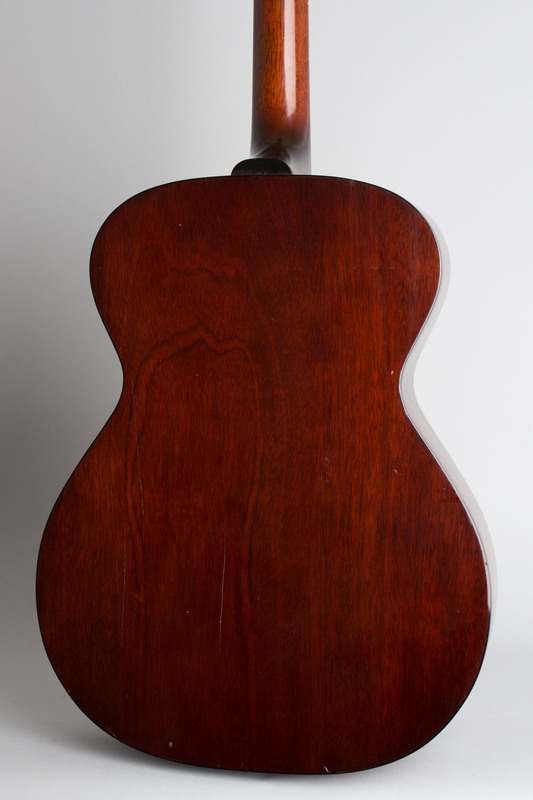 There is a cleat under the top just south of the tip of the fingerboard to reinforce that area, with some very small cracks visible just above it on the soundhole rim. The laminate back has several small grain splits to the outer layer that do not go through. The celluloid pickguard has some small marks in the center that may be shrinkage, or perhaps there was a name etched these that has been polished out. 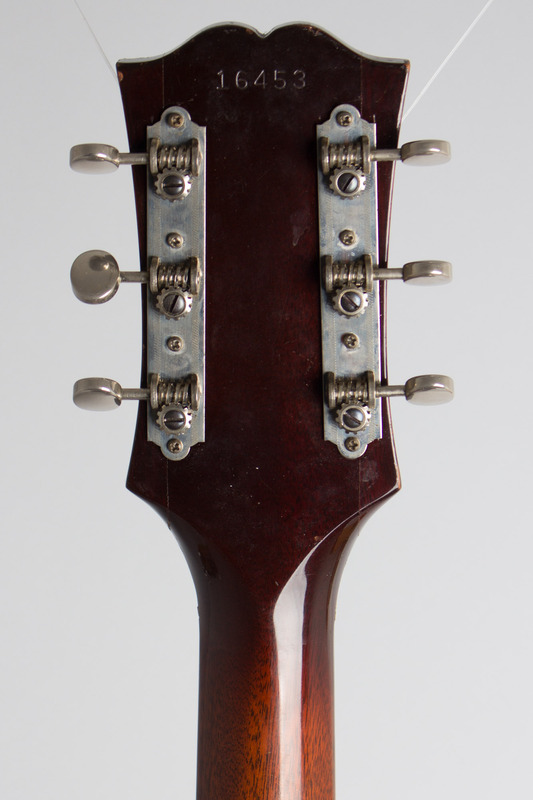 The treble side headstock "wing' has a small seam separation at the bottom. Overall this is a super nice playing nice playing and great sounding old Guild, with a lot of character to the tone. This model is one of our favorites, and is one of the best remaining bargains in a vintage American flat top. This one is cleaner than most and includes the original alligator-grain chipboard case. Excellent + Condition.